Spring is here! And with spring comes yard work. Yard work can be a real drag sometimes, but that’s only if you’re using outdated, ill-performing equipment. 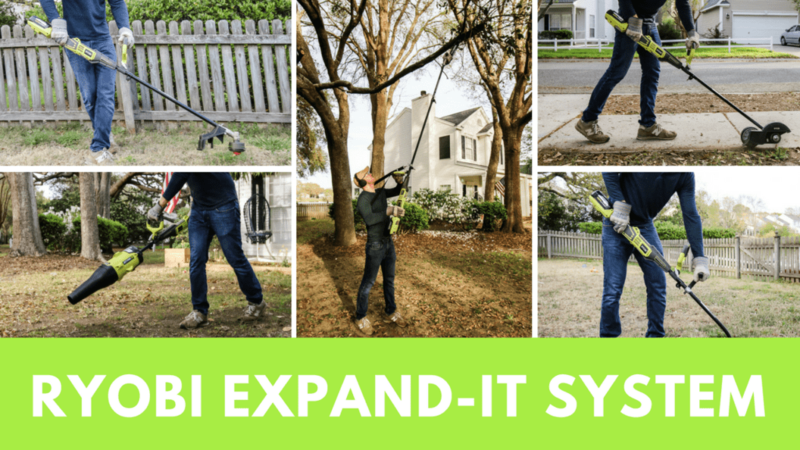 We recently switched all of our outdoor tools to the RYOBI 40v Expand-It system and they have truly made yard work a breeze. All of the tools in the Expand-It system work off the same 40 volt battery, freeing us up from costly gasoline and annoying cords. The RYOBI 40v Expand-It system has a lot of capable and handy tools, including the five that I have recently been using. Over the last two years, we’ve made a conscious choice to change as many tools as possible to battery power because of their flexibility and ease of use. We do projects indoors, in the garage, outside, upstairs, downstairs, you name it. Not having all the tools be full-sized and using attachments instead also saves tons of space in our tiny shed. Having a battery power system has been a game changer and I’m so glad that we have now expanded that to the RYOBI 40v Expand-It system. String Trimmer– This is the attachment that also comes with the body that operates the entire Expand-It system. I previously was using a gas string trimmer that constantly gave me problems when starting. It would take me 15-20 pulls on the starter, then would often cut off if I didn’t put the proper pressure on the throttle. The RYOBI 40v string trimmer attaches to the base and you squeeze two triggers (the same way you start all the attachments) and the trimmer head immediately begins spinning at a very rapid speed. I was worried that once the string started hitting material, it would slow down. Not the case. I truly think that the RYOBI 40v string trimmer is more reliable than my old trimmer at not missing anything. Overall, the ease of start compared to my old one is one of the biggest tool improvements I have ever seen. Edger– Before adding the RYOBI 40v edger attachment to my repertoire, I was using a spade on a handle to edge the sidewalk around our house. We live on a corner, so let me tell you- this was no small feat. Once I snapped on the edger attachment, I could literally do the entire yard in about one and a half minutes. The blade cuts right through the dirt and overhanging grass/weeds and I can roll it right down the sidewalk quickly. The edger leaves minimal mess, but that’s easy to clean up with a blower. Jet Fan Blower– Speaking of a blower, the jet fan blower attachment is very interesting and very versatile. This is the only attachment I own that required zero set up. I pulled it out of the box ready to go. The blower is great for blowing dirt off the sidewalk or leaves off the grass. We have four oak trees and three pecan trees in our yard and they all love to shed leaves for many months. The power from the blower was pretty strong, but I found I couldn’t control it with the trigger, so I just blew at maximum capacity the whole time, so keep that in mind if you’re looking to get one. Also, this attachment looks big, but is one of the lightest in terms of weight. Really easy to move around and I don’t have to drag a 100 foot long cord behind me anymore. Pole Saw– I didn’t realize just how bad my crepe myrtles needed to be trimmed until I started doing it. They were growing straight up and mixing with one of the oak trees. The oak trees themselves, being over 100 years old, had a lot of dead limbs as well and the pole saw attachment ripped right through them. I thought that the pole saw would eat through the 40v battery, but it didn’t at all. I did all the limbs I wanted and the battery still had a charge. The blade chain needed a little bit of tightening out of the box, but it came with the proper tool to make that adjustment, so I didn’t have to have much of a delay before reaching high in the sky to take down some limbs. Since I don’t have a chainsaw, I also see this being a useful motorized saw for lower cuts by simply detaching the middle extension pole. Cultivator– The 40v cultivator attachment was one I didn’t think I would need to use very often, but I’ve learned that when you have a tool, you find reasons to use it! I used the cultivator to till up the soil in our raised bed gardens that have been sitting for awhile, tilled up the bare patches in the front yard before throwing down grass seed and broke up the ground where we added our garden paver pathway. The cultivator churns right through soil and make it easy on my back to break up the ground. These are just the five tools I have. The RYOBI 40v Expand-It line also has a hedge trimmer, sweeper, brush cutter and more to fit your needs. RYOBI also has lots of other outdoor tools available for specific jobs. Plus, they have a great website that offers how-to’s, quick tips, and buying guides that inspire everyone to boost their home’s curb appeal and give their yard a refreshing new look. If you remember when we first bought the house, we had very little grass in our yard and horribly dead bushes everywhere. But we’ve revitalized it and learned how to maintain our grass and now our yard is a haven for us! RYOBI is starting their spring sale on outdoor power tools at The Home Depot, enabling you to save a bunch of money on the tools you need this spring and summer to maintain your yard! Just look for their end cap displays at your local The Home Depot for some sales like these! 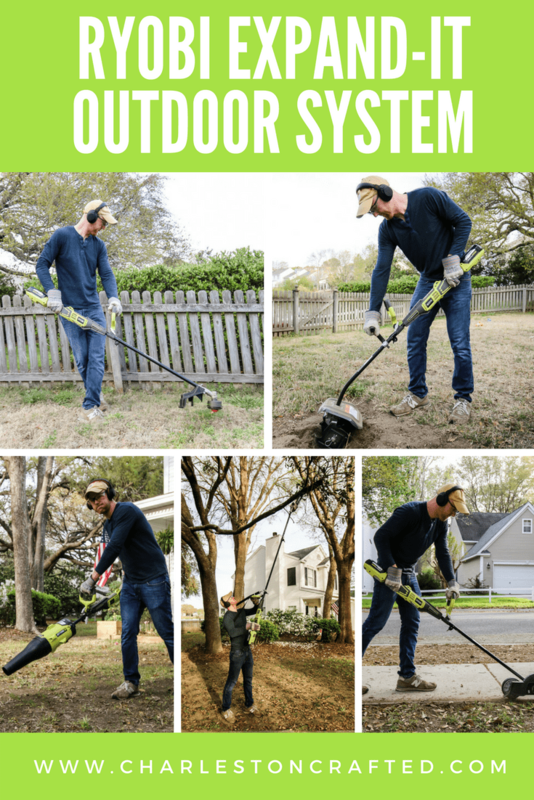 We hope you guys can use these great tools to improve and maintain your yards just as we have! If you are still a little skeptical about this line, our friend Adam over at Lazy Guy DIY also gave this Expand-It system a try and really liked it too. He also tried the RYOBI battery powered lawnmower that we need to get our hands on next!